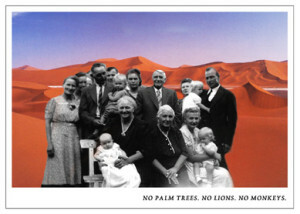 Yvette Coetzee: NO PALM TREES. NO LIONS. NO MONKEYS. My family has always been on the ‘perpetrator’ side. Great-grandfather: soldier in the Herero War. Don’t know how many he killed. Grandfather: Nazi. Parents and I: whites in the Apartheid system. And then I left Africa to its fate, and moved to Europe. If one is born “white” in Africa, paging through the family albums can raise a lot of uncomfortable questions. Yvette Coetzee, author and actress, sets out to look for the answers. In 1904 her German great-grandfather went to (then) South West Africa to fight as a soldier in the Herero War, the first genocide of the 20th century. Afterwards, he bought a farm west of Windhoek, where the author’s Grandmother lives to this day. The 89-year-old speaks German, watches German TV, clings to “her” culture in modern day Namibia. The private anecdotes of everyday events spanning four generations of a migrant family history, reflect a century of world history: from the beginning of the short German colonial period – through the Third Reich as experienced from the other end of the world – through Apartheid and independence to the current fears of white landowners that their land could be repossessed, and the African “boat people” trying to reach European coasts. The play, a solo combining elements of acting, performance and object theatre, looks for the connection between these events, attempts to find historic “truths”, and investigates personal responsibility in the face of such an inheritance. supported by FB Kultur des Bezirksamtes Pankow von Berlin and Fonds Darstellende Künste e.V. Wenn man als Weiße in Afrika geboren ist, kann das Blättern im Familienalbum reichlich unangenehme Fragen aufwirbeln. Yvette Coetzee, Autorin und Schauspielerin, macht sich auf die Suche nach Antworten. Über private, anekdotisch erscheinende Begebenheiten entwickelt sie eine Migrations-Familiengeschichte über vier Generationen. 1904 kam ihr Ur-Großvater aus Hamburg in das damalige Deutsch-Südwestafrika, heute Namibia, um gegen die Hereros zu kämpfen. 1908 kaufte er eine Farm westlich von Windhoek, wo die Großmutter der Autorin immer noch wohnt. 1904-08 begingen die deutschen Truppen ihren ersten Völkermord, sie errichteten dafür u.a. Konzentrationslager. Ort des Geschehens war Namibia, das damals Deutsch-Südwestafrika hieß. 80 Prozent der Hereros und 50 Prozent der Namas kamen um. Gegenwart: Boat-People, die von Afrika aus die europäischen Küsten zu erreichen versuchen.